Is there a better alternative to PEMDAS Widget? Is PEMDAS Widget really the best app in Mathematics category? Will PEMDAS Widget work good on macOS 10.13.4? PEMDAS Widget is a scientific calculator with an easy-to-use interface for doing calculations with equations and variables. In addition to the keypad, it also features an equation history view, which is activated by clicking on the the button next to the info button in the bottom bar. The equation history view gives one-click access to everything in the current session, including all equations and their associated results, and all variables. You can clear the session by pressing clear on your keyboard twice fast (shift+delete for notebook users), or double clicking the clear button on the calculator. 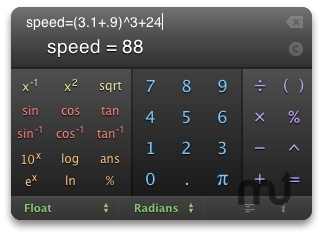 In addition, PEMDAS lets you switch between degrees and radians, and has support for percentages, trigonometric, hyberbolic, and logarithmic/exponential functions. You can also convert between hexadecimal, octal, binary, and decimal. PEMDAS lets you format the answer in scientific and engineering notation, has a preference for thousands separators, and lets you limit the amount of significant figures or decimals displayed.